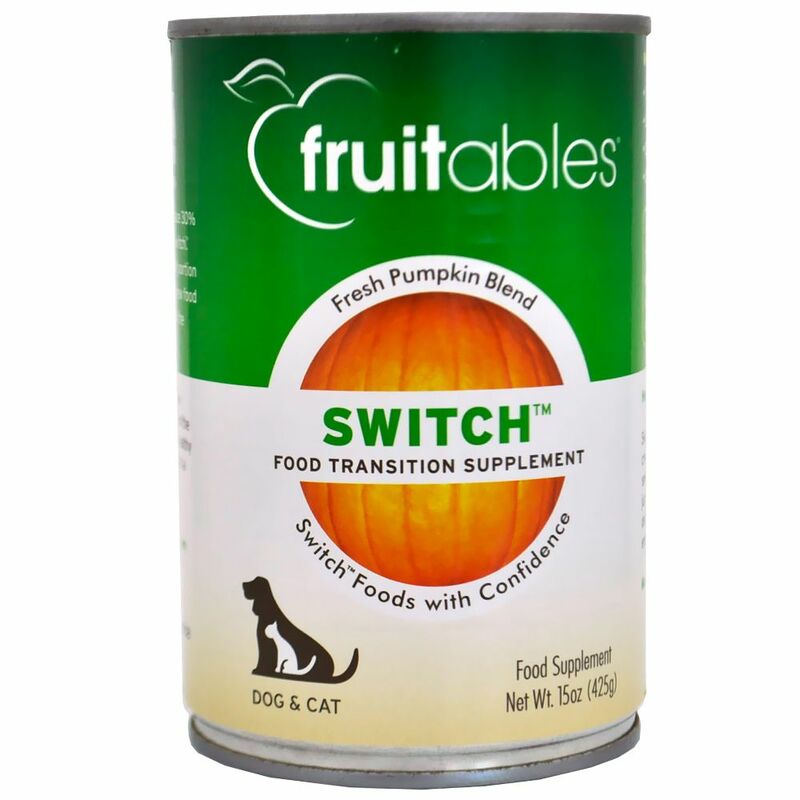 Fruitables Switch Food Transition Supplement Dogs & Cats Can Food is the perfect way to transition your pet to a new food without upsetting their stomach in the process. Many conditions can require a change in your pet's diet but abrupt changes can cause an upset stomach. This product eases the transition by providing a blend of soluble and insoluble fiber sourced from natural pumpkin. 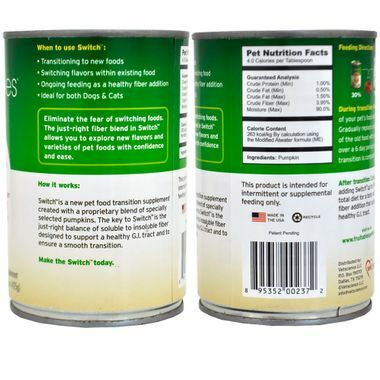 Fruitables Switch Food Transition Supplement Dogs & Cats Can Food is made here in the USA to ensure that it is safe and healthy for your pet. This can includes 15 ounces of the supplement and can help provide a smooth transition in only 6 days. If your pet needs a change in diet- don't let them suffer from a poor transition- order the Fruitables Switch supplement today! 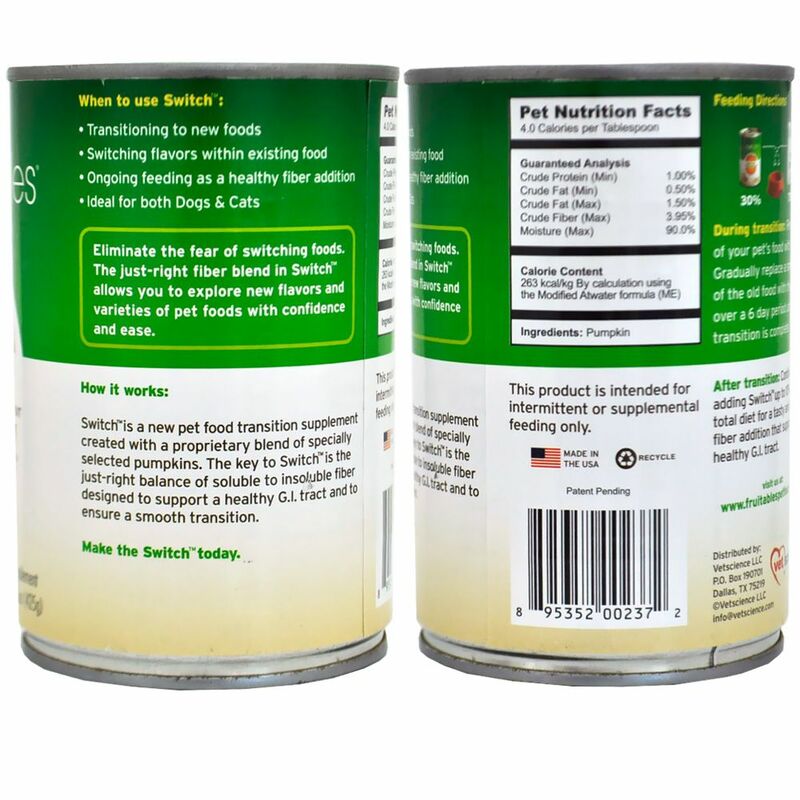 During transition: Replace 30% of your pet's food with Switch™. Gradually replace a small portion of the food with the new food over a 6 day period until the transition is complete. After transition: Continue adding Switch™ up to 10% of the total diet for a tasty and healthy fiber addiction that supports a healthy G.I. tract.